Freedom from Despair portrays true stories of the Croatian people's struggle to overcome oppression from Communist Yugoslavia and the 1990's fight to save their war ravaged homeland. International Leaders Summit on Economic Growth: "The Future of Transatlantic Relations"
KOCE-TV Will Air this Award-Winning Documentary on Jan 24, 2008 at 9 p.m.
Freedom from Despair has its public television debut on KOCE-TV Thursday, Jan. 24, 2008 at 9 p.m. with an encore presentation Sunday, Jan. 27 at 12:30 p.m.
"I am delighted to have the opportunity to present this story to the European Union thought leaders, policy makers and prime ministers from various countries," said Brkusic. "It is my hope that the screening in Brussels will spark a dialogue between international leaders and that all in attendance might look at the history of that region in a new light after seeing the film." Freedom from Despair uses first hand interviews, stock footage, news reels and narrative recreations shot in the US and Croatia to reveal atrocities committed and hidden by the communist government of Yugoslavia and its allies, piecing together a shocking world that lay silenced for the past 60 years. It follows the journey of Kruno Brkusic, repeatedly jailed by communists, who managed to escape the country on foot with a book of matches and a compass at 17 years old and later became a pro-Croatian activist in the United States. As the nation sits by and watches the carnage on television during the dissolution of Yugoslavia in 1991, Kruno and thousands of Croatian-Americans demonstrate on Capitol Hill, pushing George H.W. Bush to recognize Croatia. Interviewees include an Amnesty International Prisoner of Conscience, US Congressmen, a priest, a concentration camp survivor, authors on Croatian history, as well as Kruno, his childhood friends, and his family. About Brenda Brkusic and "Freedom From Despair"
Brkusic joined KOCE-TV in 2006 as an associate producer on the Emmy Award-winning nightly news program Real Orange, and moved on to become a production manager, producer and channel manager spearheading KOCE-TV's new OC Channel. 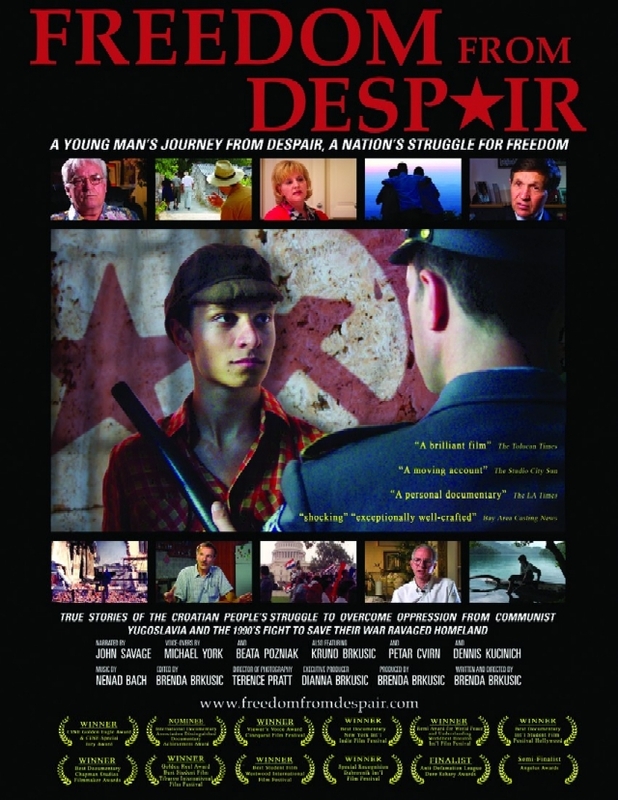 For more information about the film, visit http://www.freedomfromdespair.com/. The International Leaders Summit is co-hosted by the Adriatic Institute for Public Policy; Members of the European Parliament Roger Helmer, and Dr. Syed Kamall. Attendees will include business, media communications and political leaders from both sides of the Atlantic as well as prominent representatives from leading American and European independent think tanks. Sessions are scheduled to focus on economics, energy, justice, trade and security. The Adriatic Institute for Public Policy (AI) is an independent free market think tank founded in 2004 in Rijeka, Croatia and dedicated to advancing economic freedom and advocating free market reforms in Croatia and southeast Europe. AI focuses on promoting innovative thinking, and advancing principled and pro-growth solutions that have been successfully implemented in Eastern Europe's post-communist countries. KOCE-TV is the sixth-most watched PBS station in America with an estimated 5.8 million viewers* monthly. KOCE's award-winning programming offers the fifth-largest county in the nation a long-standing community hub for local news, culture and features, and broadcasts the best available national PBS programs to the entire Southern California five-county region. Known for its outstanding dedication to education, KOCE Classroom serves more than a half million K-12 students. A national Roper poll recently ranked PBS as number one in public trust for the fourth consecutive year. ** The winner of hundreds of awards including Emmys and Community Service Awards, KOCE continues to be a vital community resource and connector for Southern California. For more information, please visit www.koce.org.